For CE, you can find it on the new community home! 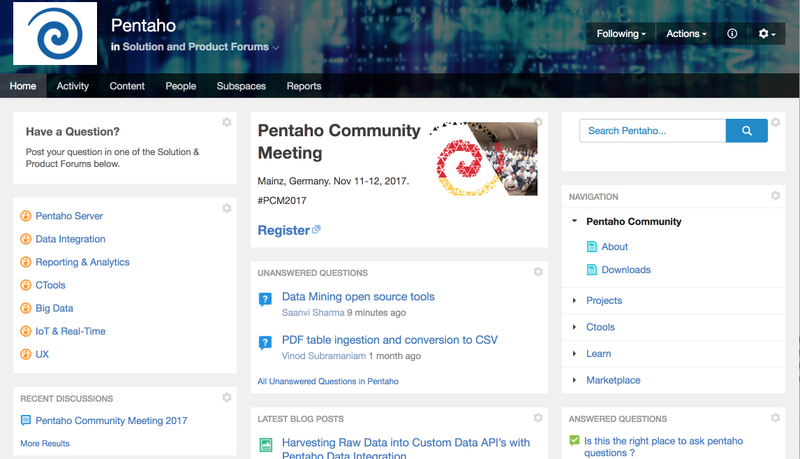 We're trying to gather people from the forums, user groups, whatever, and give a better and more modern collaboration space. This space will continue open, also because the content is extremely value, so the ultimate decision is yours. 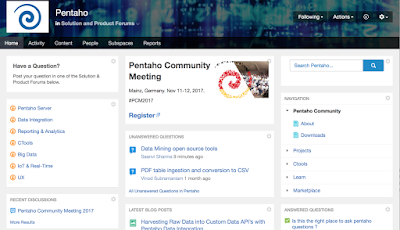 Wow - time flies... Another Pentaho World this week, and another blog post announcing another release. This time... the best release ever! Ok, let's get on with this cause there's a lot of people at the bar calling me to have a drink. And I know my priorities! This is big. I never liked the way we handled scalability in PDI. Having the ETL designer responsible for manually defining the slave server in advance, having to control the flow of each execution, praying for things not to go down... nah! Also, why ETL only? What about all the other components of the stack? It took time to get to this point, not because we didn't think this was important, but because of the underlying order of execution; We couldn't do this without merging the servers, without changing the way we handle the repository, without having AEL (the Adaptive Execution Layer). Now we got to it! Scale and load balance services , helping to deal with peaks and limited time-windows, allocate the resources that are needed. Hybrid deployments can be used to distribute load, even when the on-premise resources are not sufficient, scaling out into the Cloud is possible to provide more resources. So what scenarios will this benefit the most? A lot! 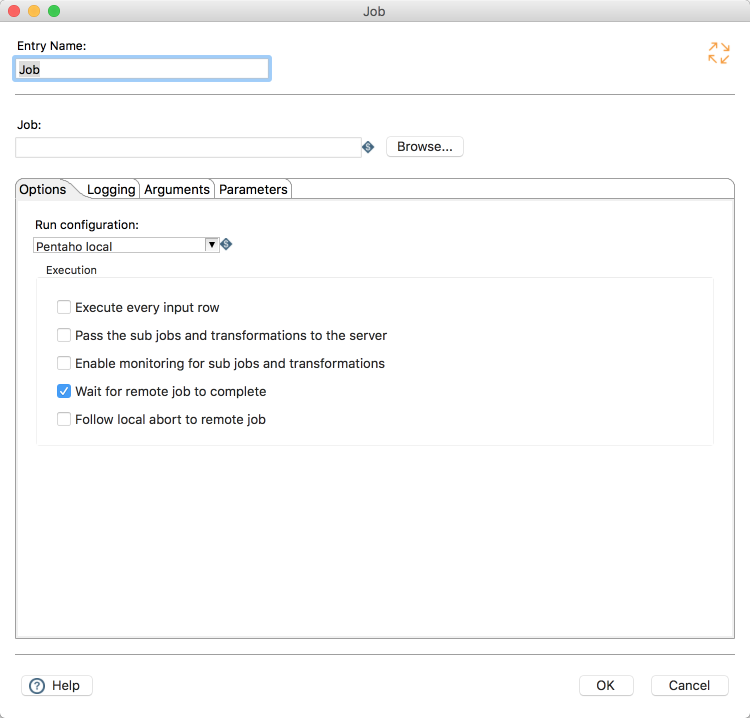 Now your server will not be bogged down executing a bunch of jobs and transformations as they will be handed out for execution in one of the nodes. This does require some degree of control, because there may be cases where you don't want remote execution (for instance, a transformation to feed a dashboard). This is where Run Configurations come into play. Also important to note that even though the biggest benefits of this will be ETL work, this concept is for any kind of execution. This a major part of the work we're doing with the Hitachi Vantara team; By leveraging Foundry we'll be able to do huge improvements on areas we've been wanting to tackle for a while but never were able to properly address on our own: better monitoring, improving lifecycle management and active-active HA, among others. 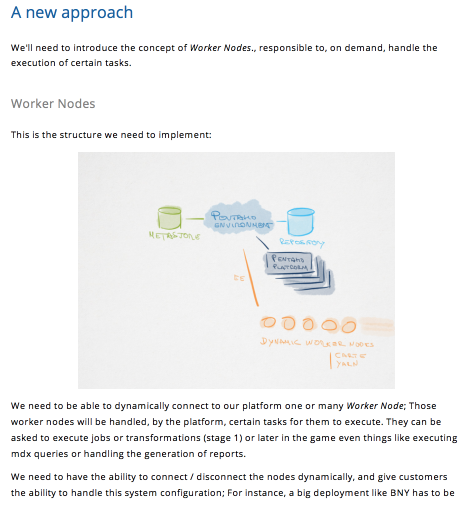 In 8.0 we leapfrogged in this worker nodes story, and we expect much more going forward! 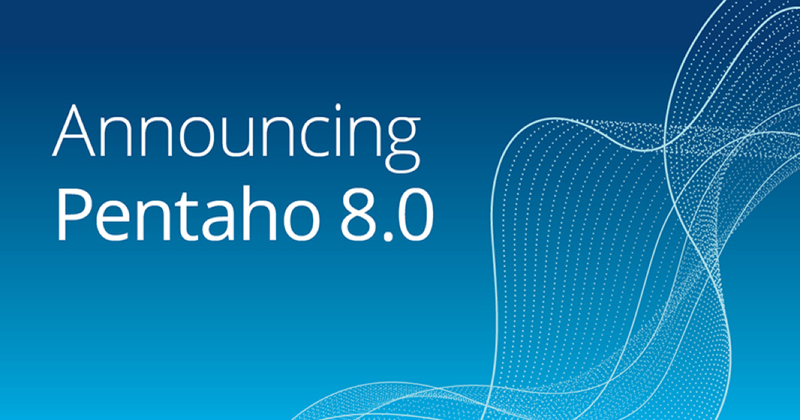 In Pentaho 8.0 we're introducing proper streaming support in PDI! 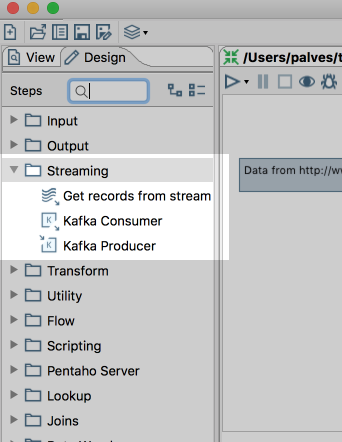 In case you're thinking "hum... but don't we already have a bunch of steps for streaming datasources? 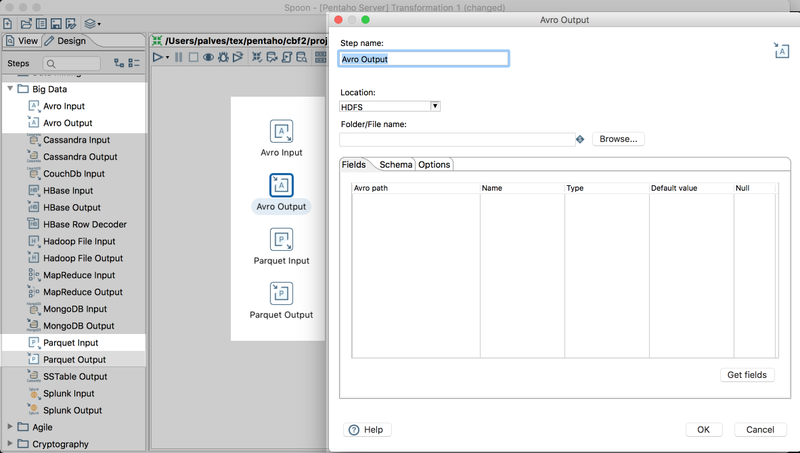 JMS, MQTT, etc?" you're not wrong. But the problem is that PDI is a micro batching engine, and these streaming protocols introduce issues that can't be solved with the current approach. 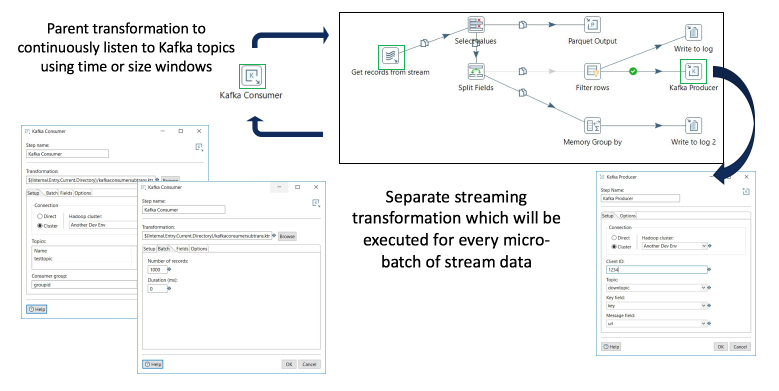 Just think about it - a streaming datasource requires an always running transformation, and in PDI execution all steps run in different threads while the data pipeline is being processed; There are cases, when something goes wrong, where we don't have the ability to do proper error processing. It's simply not as simple as a database query or any other call where we get a finite and well known amount of data. Kafka is the one that was prioritized as being the most important for now, but this will actually be something that will be extended for other streaming sources. The highlighted tabs should be generic for pretty much all the steps, and the Batch is what controls the flow. 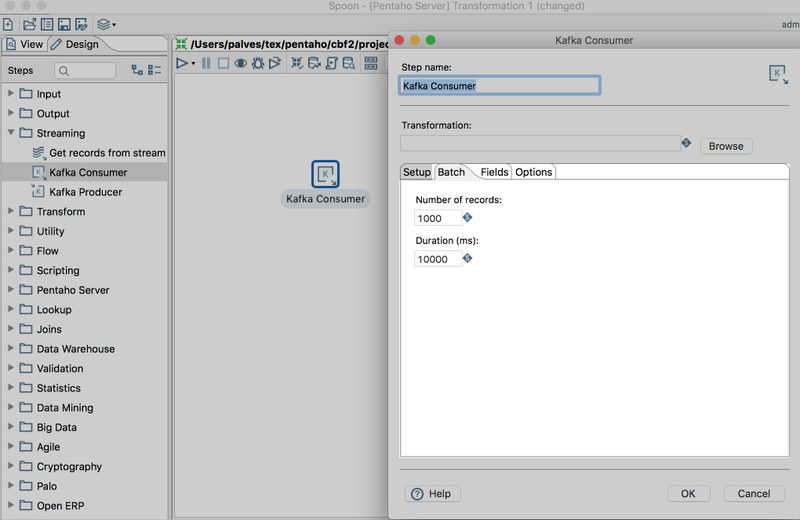 So what we did was instead of having an always running transformation at the top level, we break the input data into chunks - either by number of records or duration and the second transformation takes that input, the fields structure and does a normal execution. In here, the abort step was also improved to give you more control the flow of this execution. This is actually something that's been a long standing request from the community - we can now specify if we want to abort with error or without, having an extra ability to control the flow of our ETL. A bit better, no? Also with search capabilities and all the kind of stuff that you've been expecting from a dialog like this on the past 10 years! Same for the save experience. This is another small but IMO always important step in unifying the user experience and work towards a product that gets progressively more pleasant to use. It's a never-ending journey but that's not an excuse not to take it. 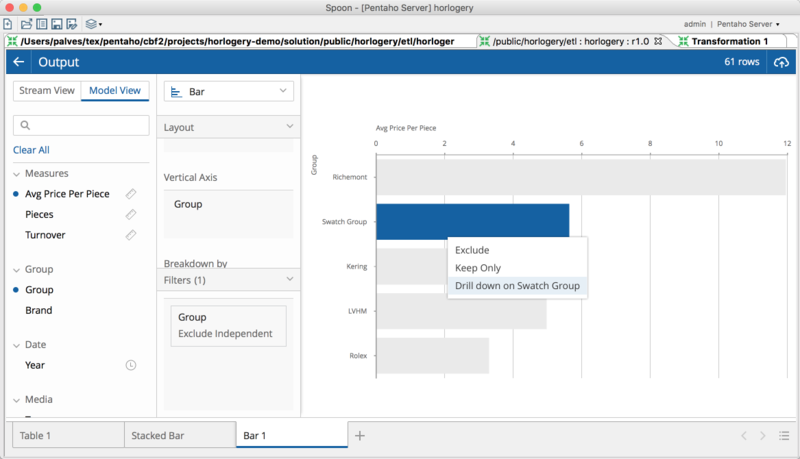 Now that I was able to open my transformation, I can show some of the improvements that we did on our Data Explorer experience in PDI. We now support the first set of filters and actions! This one is easy to show but extremely powerful to use. Here's filters - depending on the data type you'll have a few options, like excluding nulls, equals, greater/lesser than and a few others. Like mentioned, others will come with time. Also, while previous version only allowed for drill down, we can now do more operations on the visualizations. 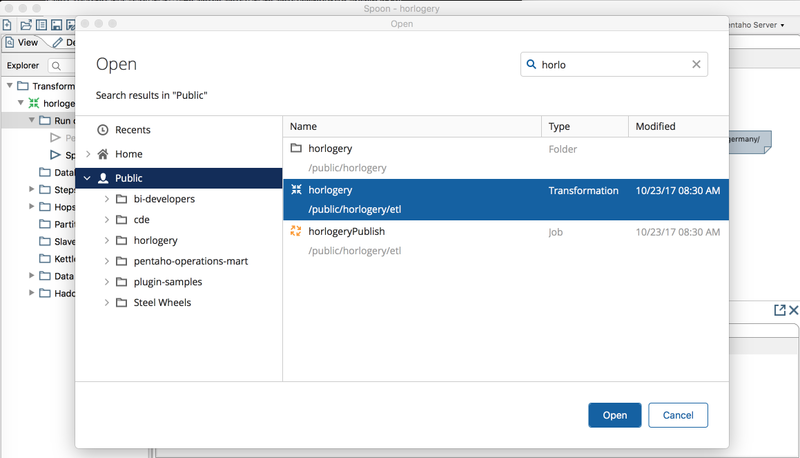 Now that we are connected to the repository, opened our transformation with a really nice experience and took benefit of these data exploration improvements to make sure our logic is spot on, we are ready to execute it to the server. 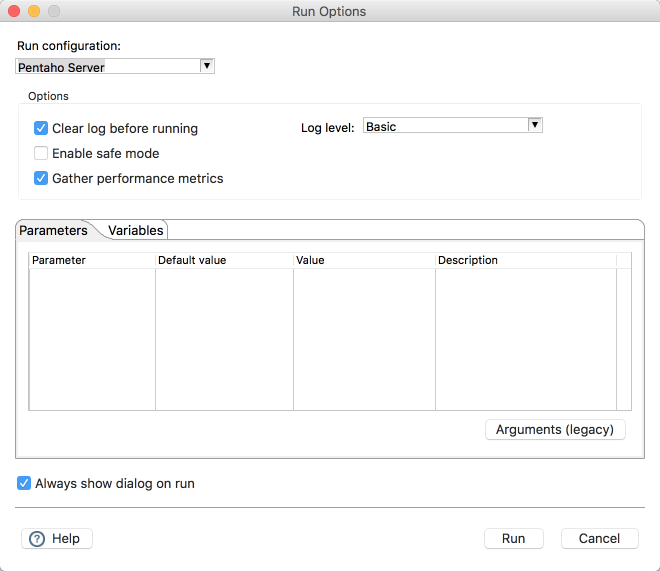 Now this is where the run configuration part comes in. I have my transformation, defined it, played with it, verified that really works as expected on my box. And now, I will want to make sure it also runs well on the server. What before was a very convoluted process, it's now much simplified. 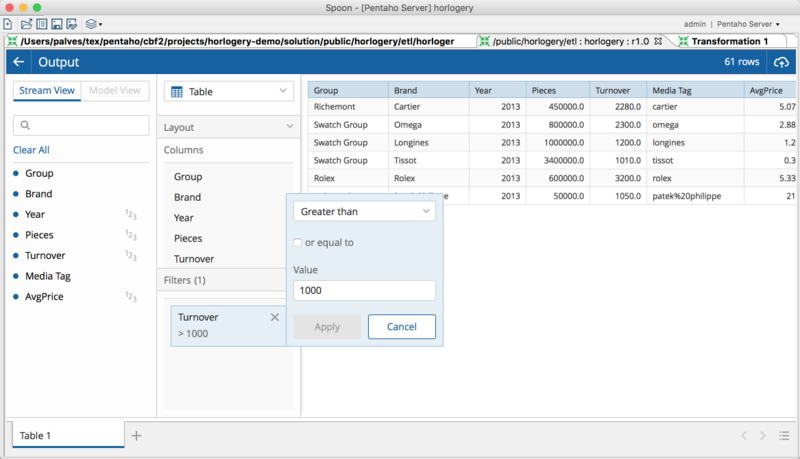 Now, what happens when I execute this selecting the Pentaho Server run configuration? 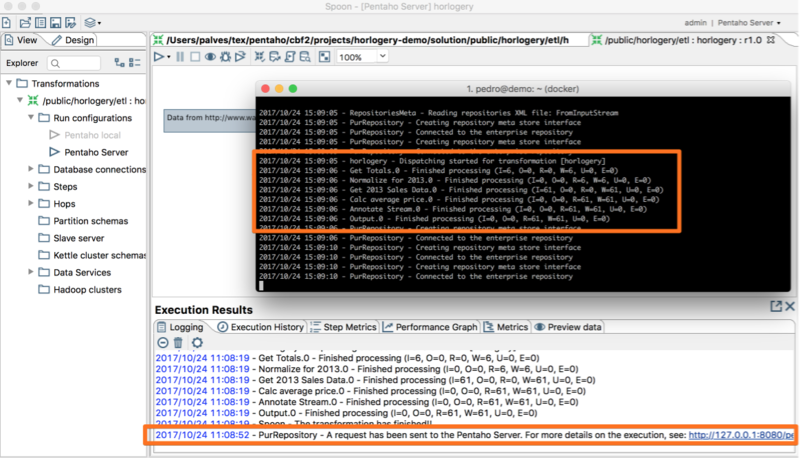 This screenshot shows PDI trigger the execution and my Pentaho Server console logging it's execution. 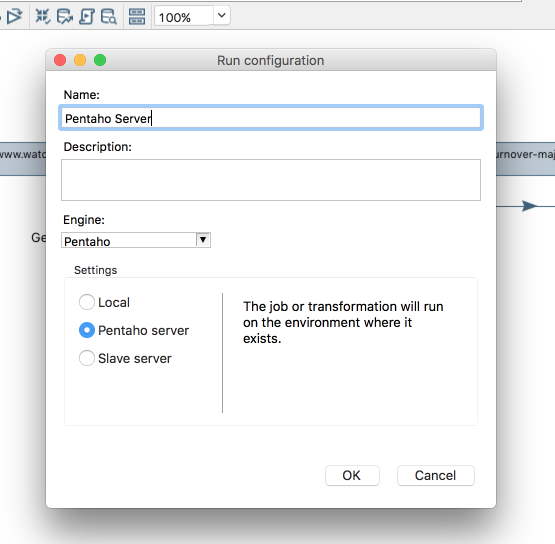 And if I had worker nodes configured, what I would see would be my Pentaho Server automatically dispatching the execution of my transformation to an available worker node! And not to mention performance improvements... One benchmark I saw that I found particularly impressive is that AEL is practically on pair with native spark execution! And this is impressive! Kudos for the team, just spectacular work! Big data platforms introduced various data formats to improve performance, compression and interoperability, and we added full support for these very popular big data formats: Avro and Parquet. Orc will come next. When you run in AEL, these will also be natively interpreted by the engine, which adds a lot to the value of this. The old steps will still be available on the marketplace but we don't recommend using them. Knox provides perimeter security so that the enterprise can confidently extend Hadoop access to more of those new users while also maintaining compliance with enterprise security policies and used in some HortonWorks deployments. 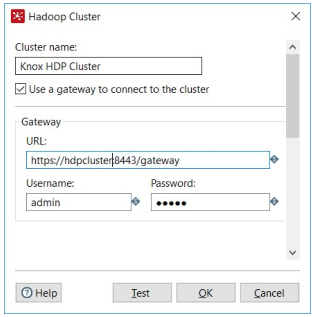 It is now supported on the Hadoop Clusters' definition if you enable the property KETTLE_HADOOP_CLUSTER_GATEWAY_CONNECTION on the kettle.properties file. 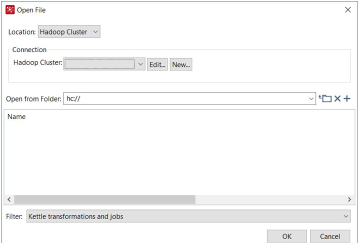 In order to simplify the overall lifecycle of jobs and transformations we made the hadoop clusters available through VFS, on the format hc://hadoop_cluster/. Now, this is actually nice! PDI is now fully mavenized. 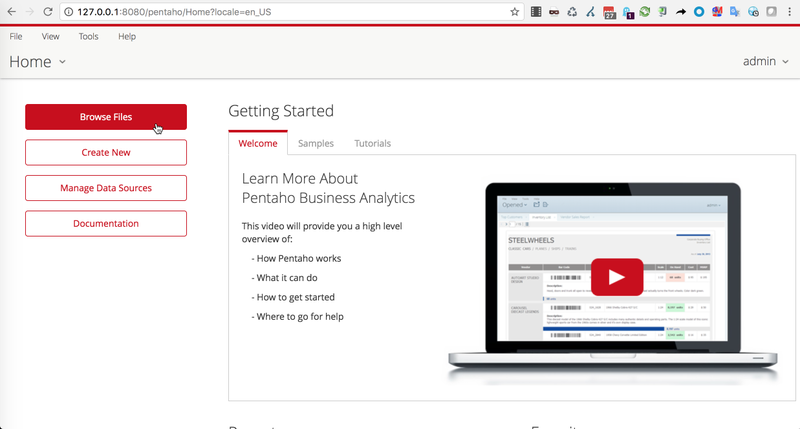 Go to https://github.com/pentaho/pentaho-kettle, do a mvn package and you're done!!! That's it - I'm going to the bar!